A wide variety of equipment is used to produce patient medical images. This includes everything from x-rays and ultrasounds to optical imaging. While many of the technologies used to record and store patient images have advanced in recent years, there are several advancements that stand out as offering the most innovation for medical imaging. Most facilities have multiple clinical systems and each of these systems may use a different format for creating medical images. The goal of the Vendor Neutral Archive (VNA) is to provide a way to store, retrieve, and query patient images using an open standard that would work with multiple systems. The concept of a vendor neutral system for archiving patient images originated in 1998. However, it was not until 2009 that the idea was developed and defined. In the last decade, more vendors have started offering VNA solutions to help improve the efficiency of medical imaging management. With VNA solutions, staff can easily access data from other departments. This also reduces the number of systems that staff needs to familiarize themselves with. Digital technology is becoming more common in medical imaging, including the use of mammograms. Digital mammography provides faster results and allows doctors to quickly share images with other medical facilities and specialists. There is also evidence to suggest that these digital mammograms are more accurate than traditional techniques for some women. Digital imaging is also present in other systems. A digital image is taken in seconds while an exam that requires traditional film may take a half hour or longer. By reducing the amount of time needed to take images, fewer patients require sedation to remain still for MRI machines and patients experience less discomfort during other exams. These advances in the last decade have led to a greater quality of care. Previously, doctors would need to insert a catheter and take an x-ray to examine blood vessels and arteries for blockage or internal bleeding. While this is a minimally invasive procedure, it can take several hours to complete and carries a small risk of blood clots. With computed tomography angiography, a catheter is not needed. A substance is injected into the arm and then a CT scan is used to examine the arteries. This procedure typically only takes 10 to 30 minutes to complete. This is safer and much faster than the old imaging method. The use of positron emission tomography (PET) scans is not a recent advancement in medical imaging. However, improvements in this technology in the last decade have allowed doctors to detect changes in the body that are connected to cancer earlier than is possible with other techniques. PET scans have become more sophisticated and capable of delivering higher-quality imaging. Doctors have also combined these scans with CT scans to gain a better view of their patients’ conditions. By combining the latest systems for taking PET and CT scans, doctors can view the anatomical details provided by the CT scan and the metabolic changes detected by the PET scan. Another advancement in medical imaging is with the creation of open MRI machines. An MRI scan may take 40 to 60 minutes to complete and the patient needs to remain still. While digital imaging has helped to reduce the time needed to complete these scans, patients often experience claustrophobia. Open MRI machines have been created in the past. However, these machines often produced lower-quality images. The latest advances have allowed manufacturers to develop machines that bridge the gap between image quality and open design. The latest open MRI machines produce high-quality images and are more open than a traditional machine. This creates a more comfortable environment for patients without sacrificing the quality of the produced image. These open machines can also accommodate larger individuals. 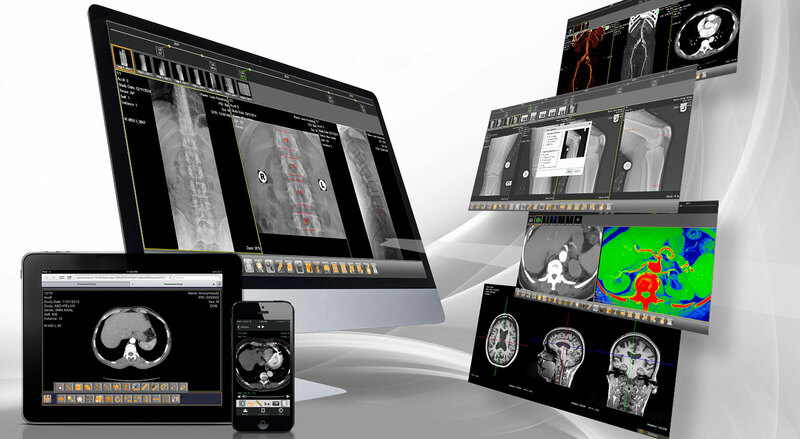 There are have been many advances in medical imaging in recent years. Improvements in PET scans, MRIs, CT scans, and the way these images are stored using PACS System has impacted almost every area of medicine. Doctors now have access to more detailed, high-quality images for better diagnoses and higher rates of successful treatment. These are some of the biggest advances in the medical imaging field. However, the future may bring even greater technologies that completely change the way the medical community views patient information.